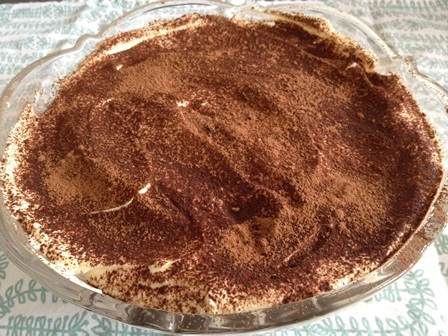 1.Put the cream, mascarpone, Marsala and sugar in a large bowl. Whisk until the cream and mascarpone have completely combined and have the consistency of thickly whipped cream. 2.Get your serving dish ready. Put the coffee into a shallow dish and dip in a few sponge fingers at a time, turning for a few secs until they are nicely soaked, but not soggy. Layer these into your dish until you have used half the biscuits, then spread over half of the creamy mixture. Using the coarse side of the grater, grate over most of the chocolate. Then repeat the layers (you should use up all the coffee), finishing with the creamy layer. 3.Cover and chill for a few hrs or overnight. This can now be kept in the fridge for up to 2 days. To serve, dust with cocoa powder and grate over the remainder of the chocolate.